Origin and Habitat: El Salvador, Guatemala, Honduras, Belize, Panamá, Nicaragua, Costa Rica, and Mexico in the states of Chiapas, Oaxaca, and Veracruz. Altitude: 1,330 to 2,500 metres above sea level. Habitat and Ecology: This species is found in tropical moist forests, cloud forest, and oak (Quercus) forest. The species can be epiphytic (grows upon another plant) or epilithic (grows on rocks). This species is threatened by local deforestation for small-holder agriculture and cattle-ranching. Marniera macroptera var. kimnachii (Bravo) Backeb. 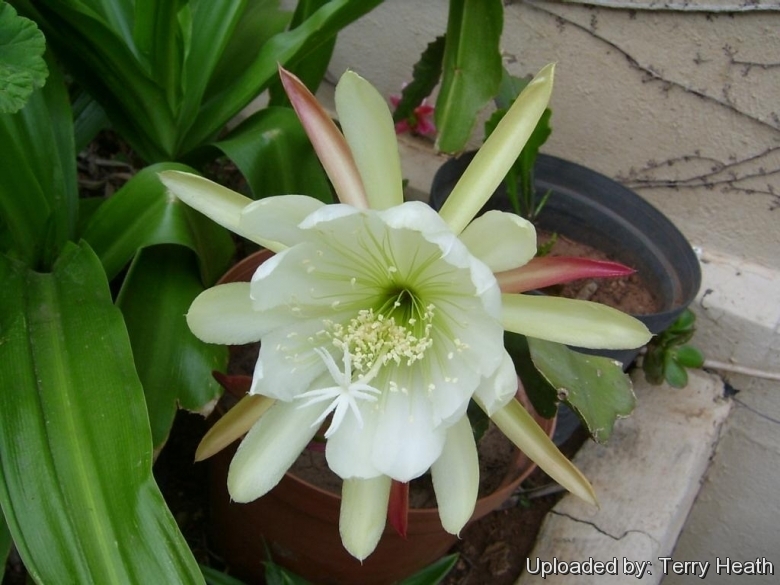 Description: Epiphyllum crenatum (Lindl.) G. Don ( Crenate Orchid cactus) is a very a very popular and well-known species with robust stems, leaf-like in appearance and with margins notched or scalloped. The outsize white, very fragrant flowers opening at night are exceptional in its genus for the longer duration of blooming the following days. It is free flowering and beautiful. Two subspecies are recognized, the nominate form and subsp. kimnachii (Bravo ex Kimnach) U. Guzmán. Habit: It is a vigorous branching, bushy, semiepiphytic perennial cactus. At first upright, then pendent, about 90 cm across. Areoles: Confined to margins, spineless. Areoles at the bases of stems sometimes bearing hairs or small bristles. Stems: Primary stems cylindrical or three-angled, becoming woody. Secondary stems unsegmented, unarmed, leaflike, rather succulent, erect to ascending, 2- (or 3-) winged, flattened for most of their length, lanceolate to long linear, terete, tapering at both ends, showing a very thick midrib, and becoming woody at base, acute or obtuse at apex, to 50(-60) cm long and 6–10 cm wide (3.5cm overall), green or grey- green somewhat glaucous, smooth, rather thick, margins with fairly deep oblique crenation (wavy-toothed). Flowers: On the tips of the stems, strongly fragrant (18--29 cm long, 10-20 cm in diameter. Pericarpel (hypanthium) 5-angled, 3 cm long, 1,5-1,7 cm thick, with acute, long-decurrent podaria, bracteoles (small bracts) subtening 0-2 (-8) spines to 7 mm long, green. Receptacle 10–12 cm long, ca 1,5 cm thick at middle, green often reddish at apex or reddish throughout, bearing numerous linear to oblong, obtuse, more or less keeled bracleoles 2–3 cm long, somewhat spreading. Outer tepals inserted within 2 cm of receptacle apex, (7-)10–12 cm long, broadly oblanceolate-linear, greenish yellow to tawny yellow or reddish amber, the outermost sometimes margined red or streaked; inner tepals as long as outer, spathulate to oblanceolate, acuminate to mucronate, white, creamy white or greenish yellow. Nectaries ca 3–4 cm long. Stamens numerous, declinate, shorter than tepals, inserted in two zones the lower one ca 4 cm long, from a point ca 4 cm from the ovary chamber, the upper zone forming a throat circle ca 2 cm above, filaments 5–7 cm long, pale yellow or pale greenish yellow; style 15–20 cm long, as long or longer than stamens, 2–3 mm thick, widest at base. Stigma lobes white, 8-9, papillose. Blooming season: Flowers in late spring or early summer, remaining open for several days. Fruits: Oblong to globose, the podaria long decurrent, acute. Epiphyllum crenatum (Lindl.) Don: (var. crenatum) has stems 6-10 cm wide with oblique lobes. Variety crenatum is distributed throughout the range of the species. Epiphyllum crenatum var. kimnachii Bravo ex Kimnach: has stems only 4-6 cm wide and semicircular lobes. Distribution: Oaxaca, Mexico. Notes: Epiphyllum crenatum, the Orchid Cactus, has been used extensively in cross-pollinating with species of other genera to develop many beautiful Epiphyllum cultivars ranging in colour from light yellowish-white and rose shade to orange and deep amber. It one of the most important parents in creating the intergeneric and interspecific Epiphyllum-hybrids commonly cultivated throughout the world. By the other hand most of the colored hybrids have mainly Disocactus genes and perhaps better referred to as Disocactus-hybrids rather than Epiphyllum hybrids. 11) Balick, M. J., M. Nee & D. E. Atha. "Checklist of the vascular plants of Belize" Mem. New York Bot. Gard. 85: i–ix, 1–246. 2000. 12) Correa A., M. D., C. Galdames & M. N. S. Stapf. Cat. Pl. Vasc. Panamá 1–599. Smithsonian Tropical Research Institute, Panama.2004. 21) Hernández, H.M., Tapia, J.L., Ishiki, M. & Véliz, M. 2013. Epiphyllum crenatum. In: IUCN 2013. “IUCN Red List of Threatened Species.” Version 2013.2. <www.iucnredlist.org>. Downloaded on 29 May 2014. Cultivation and Propagation: Epiphyllum crenatum is easy to grow and tolerates neglect. This plant (as with all Epiphyllum) prefers partial shade, and requires ample summer water (more than other cacti), but allow soil to dry slightly between waterings. Propagation: Epiphyllum crenatum is propagated by stem cutting or (rarely) by seed in the spring. Seed should be sown in well-drained compost and should germinate in 14 to 28 days at 18 to 21° C.